Are you ready for the holidays? Well, if you’d rather enjoy boomer travel adventures, or spend time with loved ones, why not save time by shopping online instead of trekking around crowded stores? That’s right, I’m declaring a no-shopping-mall holiday season! 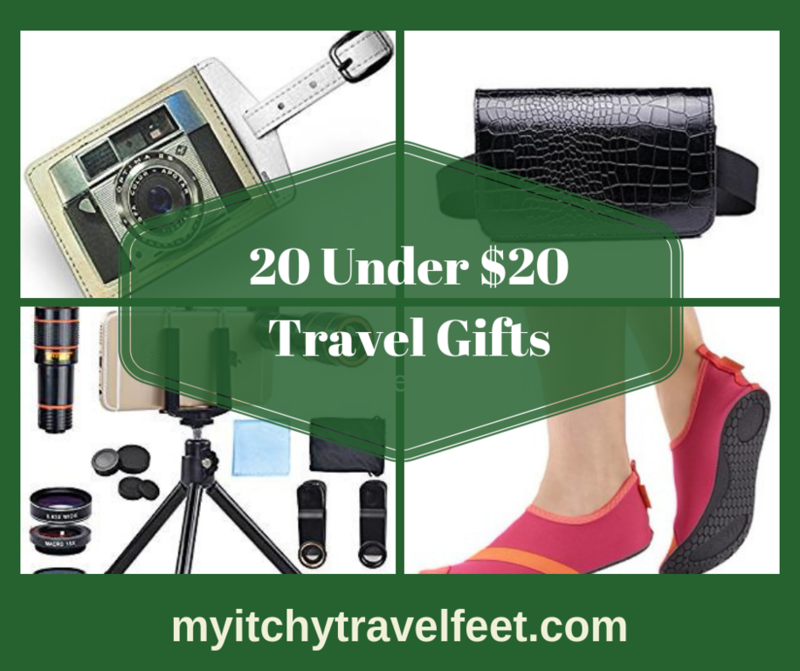 Every holiday season, I share My Itchy Travel Feet’s favorite 20 travel gifts for under $20. And this year, if I do say so myself, I’ve come up with some winners. You’re going to love these budget travel gift selections. 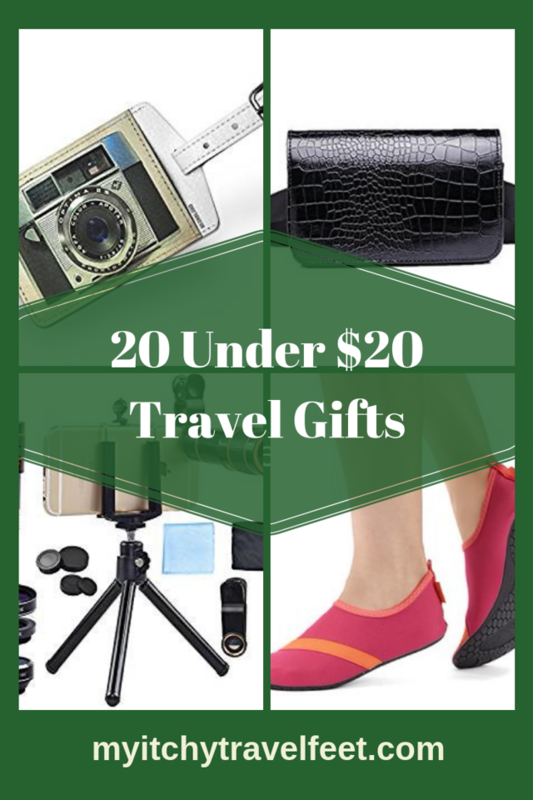 20 travel gifts for under $20 you should buy now! With that in mind, I’ve made it easy for you to buy that special traveler in your life a few useful travel items. This year’s $20 gift ideas for boomer travelers is chock full of practical, fun and comfort-inducing travel must haves. There are plenty of ideas for that on-the-go traveler in your life. And, hey, if you buy one or two things for yourself—I won’t tell. Finding inexpensive gifts for the woman traveler can be a challenge. Most items are so expensive. But I’ve scoured the Internet to find the cutest, most fashionable, and practical budget gifts for the boomer woman on your holiday gift list. Take a look! 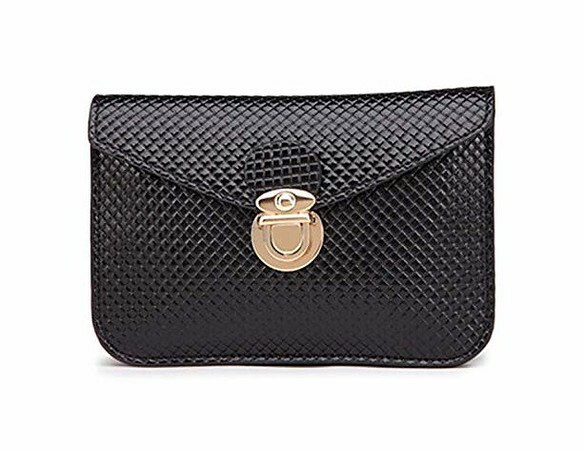 Toupons Fanny Pack is not only stylish, it’s just the right size to compliment a nice dinner outfit when you don’t want to lug around a large purse. Wear the fanny pack on a cruise excursion, then carry it to the ship’s dining room that night. You know how we feel about doubling the use of travel items so that packing light becomes a reality. Baggallini RFID Card Case has the rfid blocking technology that can really makes a difference between a good trip and a disaster. When you carry this waterproof card case, your cards are safe from that stealthy thief on the street trying to electronically access your credit data. Place your id card in the plastic window, attach keys to the keyholder and you’re all set. The Baggallini RFID Card Case is a great choice for cruise excursions. Or it fits conveniently in a small crossbody bag. Infinity Scarves with zippers are all the rage when it comes to dual purpose travel clothing. Hide your passport inside and you’re ready to go! Plus you’ll look stylish wearing it. This scarf by Pop Fashion is lightweight enough for almost any climate. Compression socks don’t have to be ugly. Keeping leg circulation in tiptop shape is always a good idea while traveling, especially for the boomer traveler. 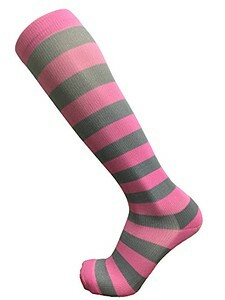 Check out these Sassy Compression Socks for the ultimate in leg care. This stylish Cashmere Blend Scarf and Wrap is a great item to have on the road. It’ll keep you warm as you explore cold-weather destinations or just snug as a bug on the flight over to Europe. And it comes in lots of colors. Maybe you should buy one for the woman traveler on your list plus another for yourself. Ribbon Crusher Travel Hat is great for those boomer women who need sun protection or for the fashionista who wants to look trés chic. 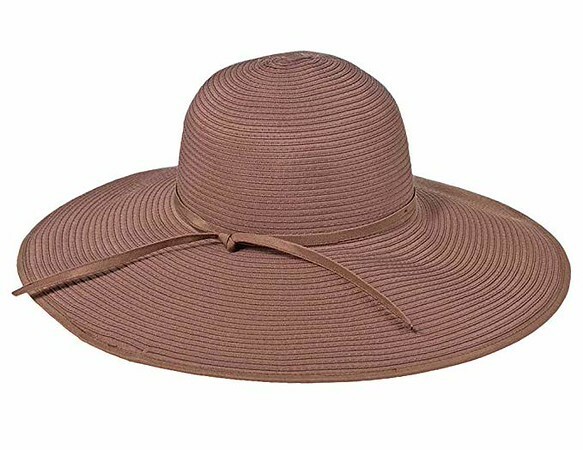 Available in brown or green, this wide-brim sunhat is a must for wearing on a big city walking tour, on the deck of your cruise ship, or at the beach. And, even better, cramming the hat into your suitcase won’t hurt it one bit. 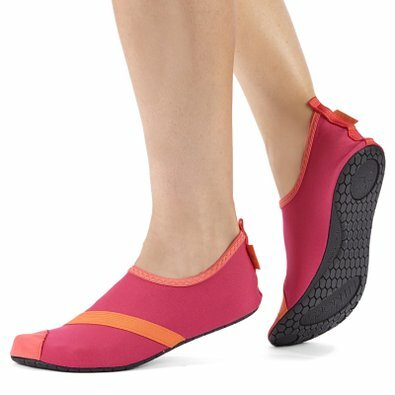 FitKicks Active Footwear for Women are extremely handy when it comes to any sporty activity you may want to do while traveling. The soles won’t mark up the deck of a boat, just in case you’re invited on that luxury yacht. You could wear them as bedroom shoes in your hotel room, in your cruise cabin or even on the plane. Remember, we’re all about packing light! Durable, flexible and available in lots of colors. What’s not to like? And FitKicks don’t take up much-needed space in your suitcase! Hanging Travel Jewelry Hanger Holder keeps you organized. Sick of getting your jewelry all tangled up? Use this hanger holder! Or put makeup in it. Or both! With several color patterns to choose from, you’ve just found a cute stocking stuffer (the holder rolls up) for the woman traveler in your life. How do you find a unique travel gift for under $20? Start here. These are perfect if you’re playing Secret Santa or just want to impress a family member with your gift giving creativity. Do you laugh a little to yourself when you realize that your suitcase is the same as about 10 other people waiting at the luggage carousel? It’s black, right? 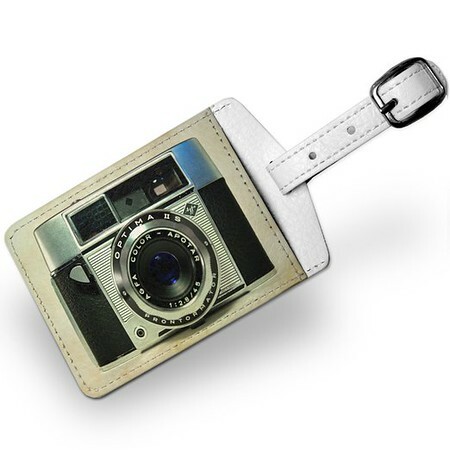 Add a little style to your luggage with this unique Vintage Camera Luggage Tag. 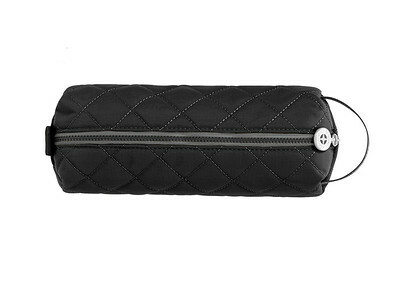 Baggallini Tech Pouch and Pencil Case holds all those pesky cables and cords that power electronic devices. You know, the ones that stay continuously tangled up, or even worse, lost in your purse? Now you’ll know where to find them! The pouch’s sleek, compact design is perfect for tucking into the corner of a personal item carryon bag. Nothing can ruin a great trip faster than realizing that your clothes are covered in shampoo slime. LiquiSnugs will protect you from that problem. Made of silicon, LiquiSnugs are virtually leakproof and are incredibly durable. See-through and less than 3.5 ounces, LiquiSnugs qualify as TSA approved. You’ll sail through security as long as you include them in the bag of liquids that you send through the screening process. 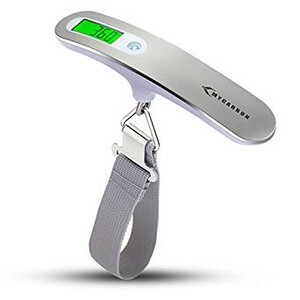 Use this cool Electric Luggage Scale to help avoid those frustrating overweight luggage fees at the airport. Weigh bags before leaving home, when there’s still time to remove items. The scale is especially useful for the cruisers on your gift list. Luggage seems to grow after a long cruise. It’s all that shopping! 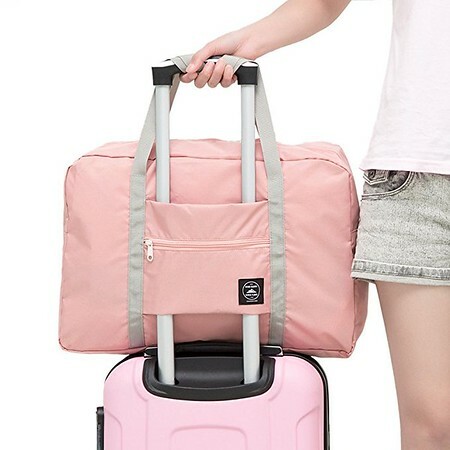 Waterproof Foldable Tote Bag is a handy solution when you’re cramped for space. Pack it in your luggage on the way to the trip for use as a beach bag or to hold items during a cruise excursion. The tote bag also works well for the shopper on your holiday list. The bag stays tucked away until the return home when it’s loaded with precious purchases. There’s a pouch that fits right over a carryon handle. Travel photography equipment has come a long way. No more lugging that huge camera bag with several lenses and a bulky tripod. And that’s a good thing since airlines are constantly lowering the size limit of what you can bring onto the plane. I’ve found a couple of handy gifts for photographers that are perfect for saving space. And they’re under $20! Apexel 4 in 1 Iphone Camera Accessories is perfect for the phone camera enthusiasts. 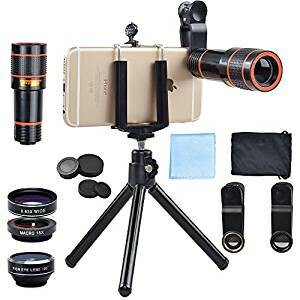 It comes with a 12x zoom telephoto lens with manual focus ring, fisheye lens, as well as two macro and wide angle lenses. Take great travel photos with this setup! 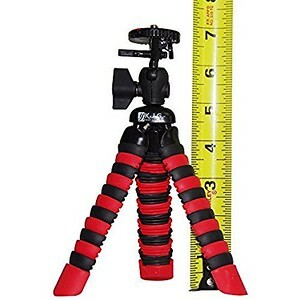 A lightweight Travel Tripod is always a good idea for that intrepid photographer in your life. Designed for digital cameras, this tripod helps eliminate shake for that perfect sunset shot. Hold on! I’m not done, yet. We have five more budget-friendly gift suggestions to go! 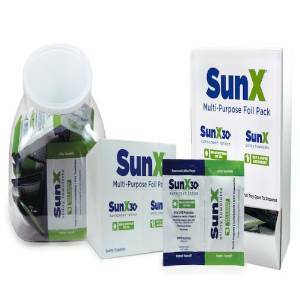 Coretex SunX SPF30 Sunscreen with Towelettes give you the confidence to take an impromptu trip to the beach or pool while traveling. I personally hate having to buy a large bottle of sun cream for one or two days because I always end up throwing it out, basically full. Take these useful towelettes with you to protect your skin and your wallet! 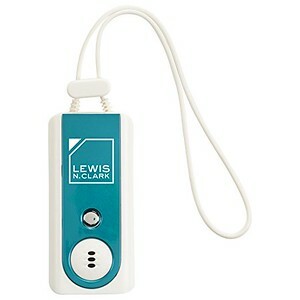 Lewis N. Clark Travel Comfort Set is a great gift to up the luxury in travel. 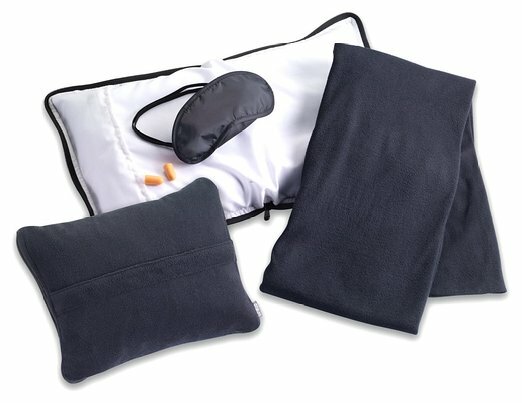 Soft and easy to pack, this all-in-one set is a wonderful way to upgrade your experience when flying economy on an international flight. If you can’t join em up front, at least you’ll be more comfortable. Travel Door Alarm and Flashlight keeps your favorite traveler safe and sound. Hang it from the doorknob of your hotel or cruise cabin to get a safe night’s rest. This is a great gift for solo travelers. I believe that you can never have enough totes. 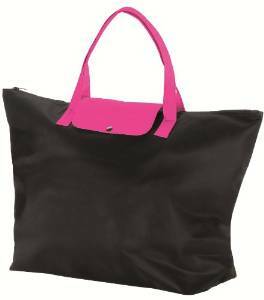 Travel Smart All Purpose Microfiber Tote Bag is the perfect travel companion in so many ways. For most, this size makes for a perfect shopping tote as you wander European cities. Durable and comfortable, this tote bag folds into your purse until you need it. Feel like an organized traveler even when that’s far from the case. 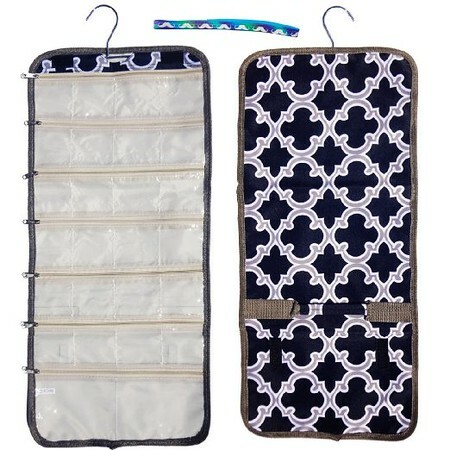 HiDay Travel Pouches really help you to stay organized on any trip. 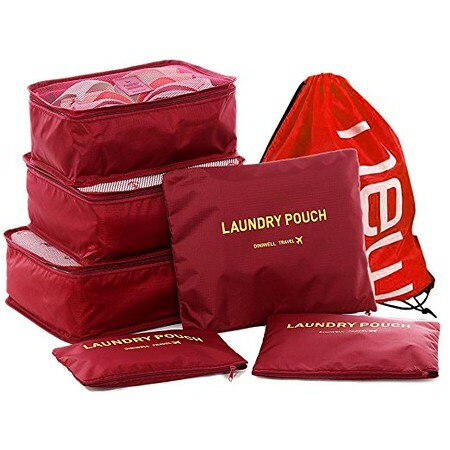 These travel cubes and pouches come in a variety of colors. Plus they’re so affordable! Here’s every item we’ve ever recommended (that’s still for sale) in our budget gift guide series. Traveler gifts under $20. Be sure to check back each year as we publish our latest choices for best travel gifts under $20. Or subscribe to the My Itchy Travel Feet Weekly Broadcast to be the first to know!